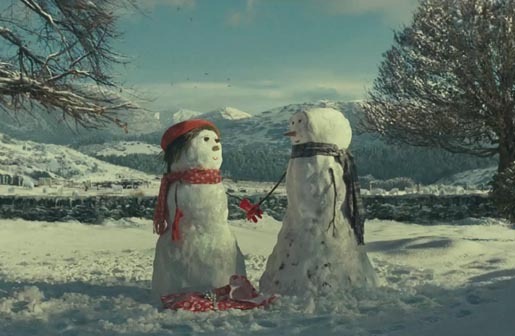 John Lewis, the British store chain, has launched its 2012 Christmas-themed television commercial, “The Journey”. The ad features a snowman on an epic journey to find suitable trimmings for the season. The ad is set to a version of Frankie Goes to Hollywood’s The Power Of Love, sung by Gabrielle Aplin. The Journey was developed at Adam&EveDDB, London, by executive creative directors Ben Priest, Ben Tollett and Emer Stamp, creatives Frank Ginger and Shay Reading, and agency producer Lucie Georgeson. Filming was shot by director Dougal Wilson via Blink Productions, London, with director of photography Eduard Grau, producer Ben Link and production designer Andy Kelly. Editor was Joe Guest at Final Cut. Visual effects were produced at Moving Picture Company by VFX producer Sam Davidson.